Population: 390,000 in Mali (2009 census). Region: Koulikoro Region, Kati circle, south of Bamako, west of Niger river, into Kangaba circle, 5 communes; Sikasso Region, Yanfolila circle. In February 2011 a survey was conducted to clarify the geographic boundaries involving several speech varieties of the Mandé language family spoken in southern Mali and northeastern Guinea, with relevance to the northwestern corner of Côte d’Ivoire. The implicated speech varieties are Bambara [bam] (i.e. 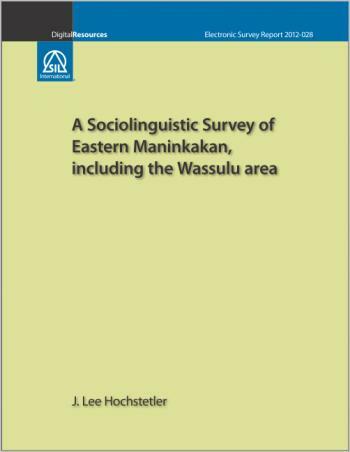 wassulunkakan dialect), Eastern Maninkakan [emk], Wojenakan [jod] (i.e. folonkakan dialect), and Jula [dyu]. The tools used were a participatory mapping exercise, a group questionnaire, individual questionnaires, and a sentence repetition test. The results indicate that the boundaries of Eastern Maninkakan form a polygon roughly following lines drawn from Bamako (in Mali), to Dabola (in Guinea), to Faranah (in Guinea), to Kérouané (in Guinea), to the point where Guinea, Ivory Coast, and Mali come together, and back to Bamako. In addition to literature already being developed in the maninka-mori dialect of Guinea, it is recommended that another literacy program be developed in Mali for the Maninka people living south of Bamako, resulting in two programs for Eastern Maninkakan.